This classic dessert recipe is quick and easy to prepare and then cooks while you enjoy your main course. Put the rhubarb in a 1.2 litre ovenproof dish. Sprinkle over 50ml cold water and the caster sugar. Sift the flour into a bowl, add the butter and rub in with your fingertips until the mixture resembles breadcrumbs. Alternatively, pulse in a food processor. Stir in the demerara sugar. 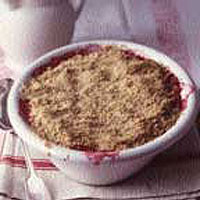 Spread the crumble mixture over the rhubarb - don't pat it down too much. Bake for 35-40 minutes or until the top is golden brown and the rhubarb bubbling through at the edges. Serve hot with cream, custard or ice cream.